On the 8th of May, 4 runners (Andrea, Denis, Laurent & Mike) will set out at 3 in the morning to run around Koh Samui, the 50km main loop. Start/Finish will be at Anantara Bophut. 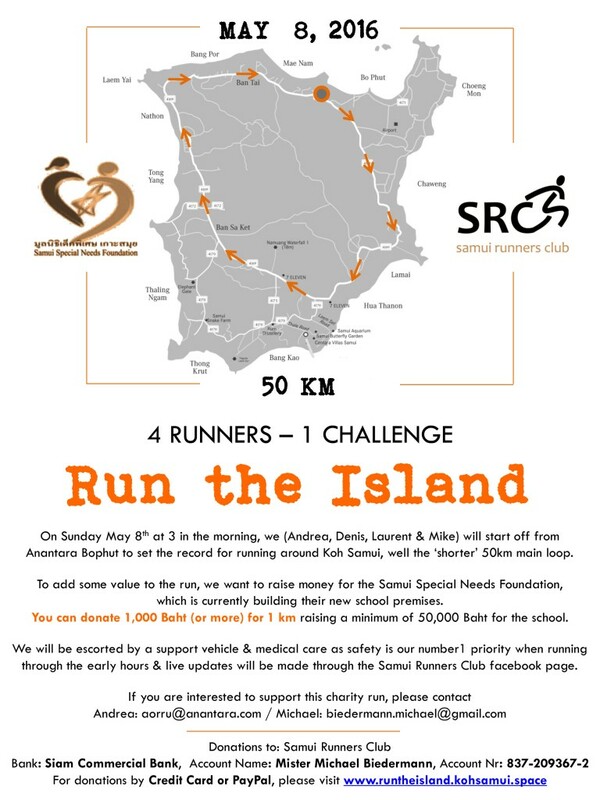 To add value to the run, a kind hearted team are raising money for the Samui Special Needs Foundation to assist with finishing their new school premises. The group are asking the public and hotels and their staff for kind generosity to donate any amount to this project. Please note that this is a pure donation, the funds are not to print any posters, t-shirts or any other advertising, so there will be no ‘value’ as a resort to ‘sponsor’ this effort will concentrate more on a personal donation, however larger hotels are more than welcome to contribute. The runners planning to finish the run in around 6-6 1/2 hours & will immediately after the finish line handover the check to the Foundation.